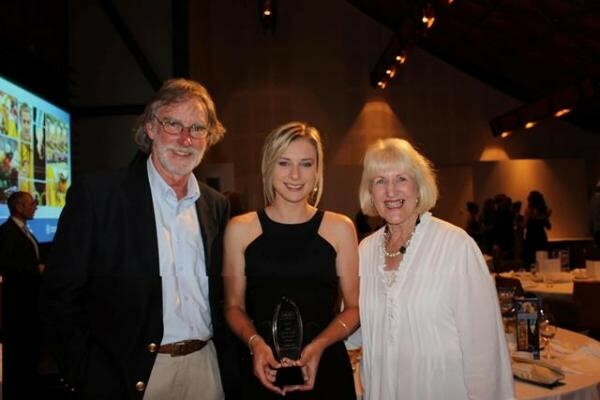 Congratulations to Annette Edmondson for being awarded the Amy Gillett-Safe Memorial Award at the recent 2012 South Australian Sport Institute Awards. The Amy Gillett-Safe Memorial Award is presented annually to an athlete who exemplifies characteristics that Amy possessed and lived by. The award is presented by Amy’s parents Mary and Dennis Safe. Annette has just finished an impressive 2012 at the elite level of the sport with a bronze medal in the Women’s Omnium at the 2012 London Olympic Games. Annette also won Silver in the Women’s Team Pursuit as well as the Omnium at the UCI World Track Cycling Championships in Melbourne. Away from the track, Annette has complemented her studies around her cycling commitments and is currently studying Health Science at Adelaide University.